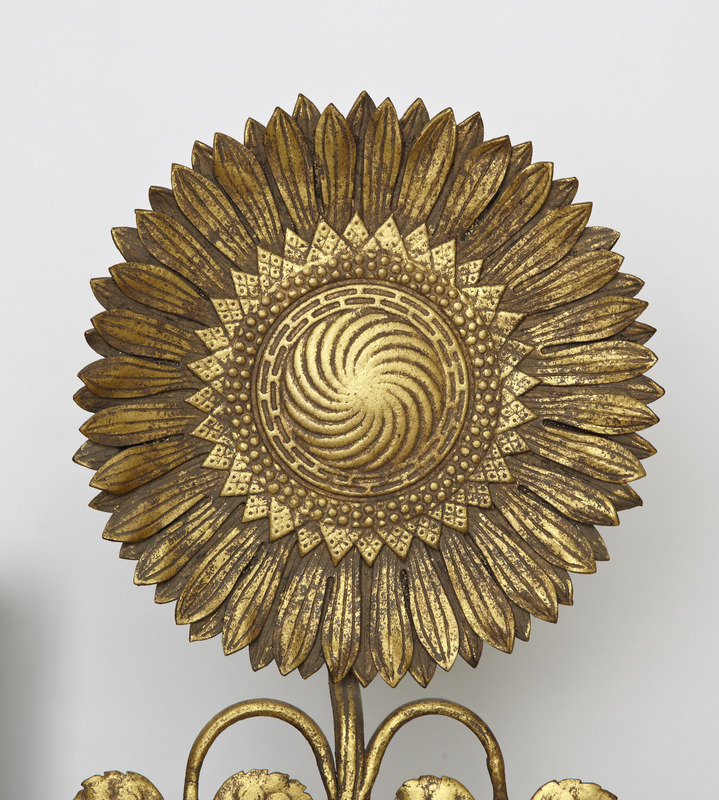 These cast- and wrought-iron andirons, designed by Thomas Jeckyll, take the form of the sunflower, one of the floral emblems of the Aesthetic Movement. The design was likely created specifically for Frederick Leyland's dining room at 49 Prince's Gate in London, though the andirons eventually became commercially available through the Norwich firm of Barnard, Bishop & Barnards. The company's 1878 catalogue offered them in wrought-iron or polished wrought-brass. This pair, which were acquired by the Freer in 1980, are not original to the room, but are virtually identical. The Leylands' andirons, like these, were gilded. Legend has it that those at Prince's Gate may have originally been brass, and that Whistler later gilded them as part of his total redecoration of the room between 1876 and 1877. Thomas Jeckyll (1827-1881), "Sunflower andirons," in The Peacock Room, Freer Gallery of Art, Smithsonian Institution, Accession No. FSC-M-66a-b, Item #3071, http://www.peacockroom.wayne.edu/items/show/3071 (accessed April 19, 2019).